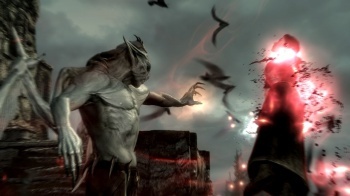 Seven months after releasing on the Xbox 360, Skyrim's vampire-filled Dawnguard DLC will be available on the PS3 today. It's been a long, hard road for Skyrim DLC on the PS3, but it looks like PS3 gamers are finally going to be all caught up. The first expansion released for The Elder Scrolls V: Skyrim, the vampire-tastic Dawnguard, is due to hit the PlayStation Network later today. Dawnguard has been available for the Xbox 360 since last June, when we speculated that there would be a 30 or 60-day wait for it to go multiplatform. Though it was the first Skyrim DLC released on Xbox 360, Dawnguard is the last expansion to hit the PSN; Dragonborn and Hearthfire also made their way to the PS3 earlier this month. To make up for the delay, Dawnguard will be 50% off for the first week it's available, bringing the price down to $9.99 for a limited time. It's a shame that those who prefer the PlayStation 3 had to wait so long to get their Skyrim DLC, but better late than never, I guess, right? Besides, with so much content in the core game, it's not like anything was stopping PS3 owners from playing Skyrim in the meantime. Well, other than the technical issues. At any rate, congrats, PS3 owners! You can finally experience what the rest of us have been doing in Skyrim for the last seven months.